Imagine you want to explain something to someone. Something that might be hard to transfer. Like an idea or concept. Something that is very comprehensive and hard to capture in a few words. You might consider making a whiteboard animation. A tool that is excellent to share thoughts and knowledge. Because allows you tell a story. The visual images support the story and make your message easier to process. And the short duration of the animation forces you to get to the core of what you want to tell. A whiteboard animation might seem simple to make, but there is a lot more to it than you think. 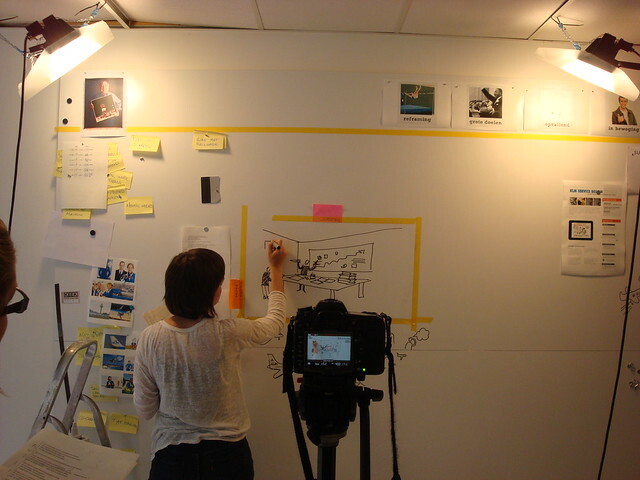 This is the first of two blogpost that will tell you a bit more about how to make a professional whiteboard video. We don’t want to tell you how you should do it. Just how we did it. It might help you if you want to make one yourself. In this first part we will cover the practical side of making a whiteboard animation: lighting, filming and post-processing. It is about knowing what your result should look like, knowing what you need to do and being creative enough to make it happen! You might want to watch this video in advance. It shows you how it is done in a professional studio. The first step is to get your lamps in place. 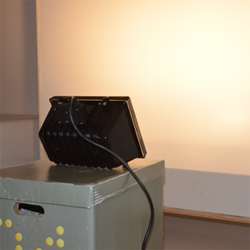 The better your lamps are positioned, the easier it is to set the camera settings and do the post-processing. Shut drapes and close doors. 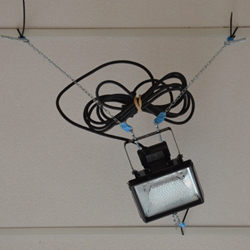 Make sure no other light sources can interfere with your lighting setup. an even fill on the whiteboard. So if you have them, turn that switch. Now we’re really starting! We’re going to build two diffusers for the 400W construction lamps. After that we’ll put them in position by cleverly hanging them from the ceiling. A diffuser spreads out the light. The result is a softer light and reduction of shadows. The lamps with diffusers need to be above eye level and close to the whiteboard. Of course you can use huge tripods to put them in position. 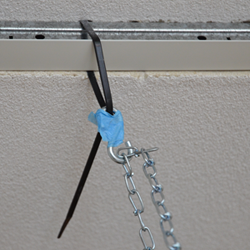 But because we work on a shoestring budget we chose to hang them from the ceiling. 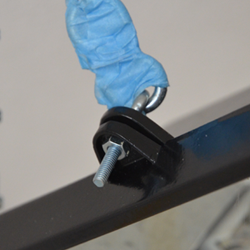 To make the position of the lamp easy adjustable we chose to hang them from three points. 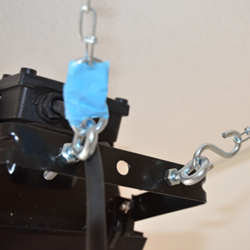 To make it easy adjustable in height we used hooks and chains. 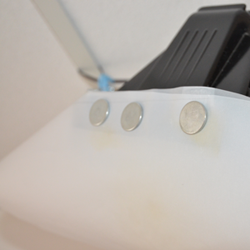 Now that you’ve set up the lamps for the illumination of the whiteboard you can start adjusting. Try using multiple layers of translucent paper and different positions of the lamp. 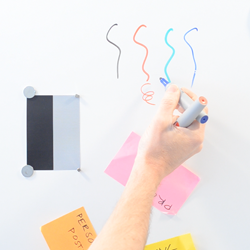 Keep in mind that you want an evenly illuminated whiteboard and no distraction shadows. Ok, we have a beautiful light on the whiteboard but we want our talent to look good too. To make this happen we’ll create some sort of softbox. 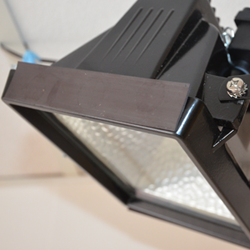 Get your 1000W construction lamp ready and make your talent shine in the video! 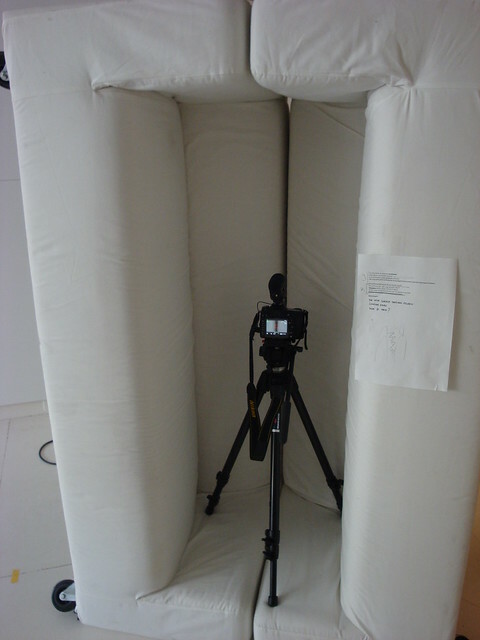 If you watched the video ‘how to light your whiteboard video professionally‘ you saw that you need two softboxes to illuminate your talent. This is to create a nice large area from which the light comes. There are many DIY instruction video’s to built these yourself. We chose a different solution. Tip! You might get a bit of a glare on your whiteboard when using this method. Make a few drawings on your whiteboard to test if this is the case. Adjust the position of the lamp until the your board is free of glare. Great! You’ve got all the lamps in place. 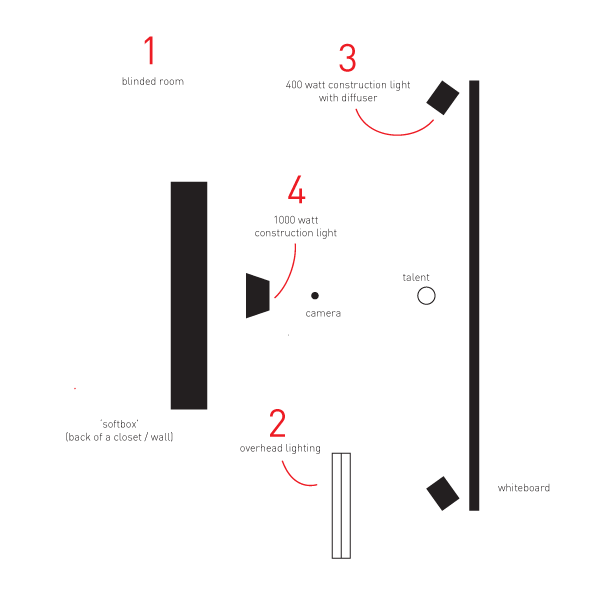 Check out the overall lighting of your talent and your whiteboard and make some small adjustments here and there. Don’t put to much effort in it, the real fine tuning will take place in the next step. This is where the trial and error part really begins. There are many settings that can influence the quality of your lighting. We’ll cover the most important ones we came across. Connect your camera to your computer or use the SD card to quickly test your settings on screen. 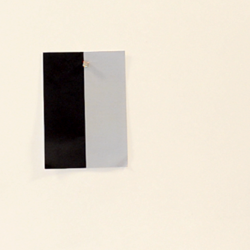 A grey card provides a standard reference object to determine the exposure of your video. When you start post-processing later on, the grey card will help you to get a consistant exposure throughout. Make a card with a black and a grey colored area. Make a shot of the card before you start filming. Tip! When you use multiple colors in your video your can add them to your ‘grey’ card as well. Unfortunately the auto settings of your camera will not get you to where you want to be.. So when you’re almost fed up with trying out the many combinations, remember that you will be rewarded for it during the post-processing. Make some test shots with different settings of the aperture, iso, white balance and exposure. Make sure someone is drawing on the whiteboard while you make the test shots. Tip! 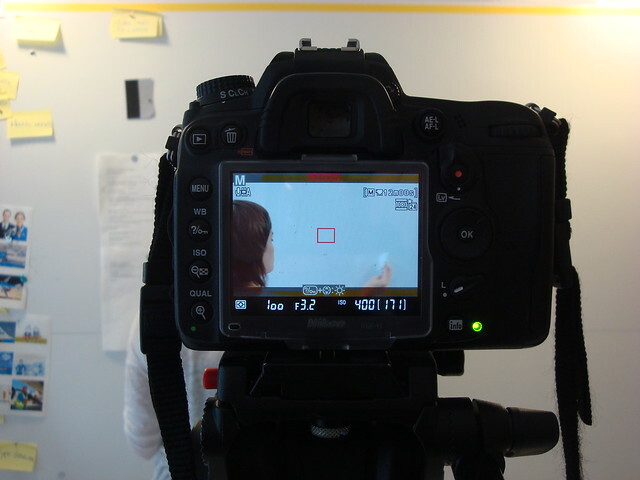 write down the settings on the white board before you film. This way you know exactly wich settings you used in wich shots. Ok, now that you’ve made some test shots, we’re going to see how they look on screen. Load your test films onto your computer and have a close look. Go back to the beginning of this chapter to check what you have to look for. Use a tool like “DigitalColor Meter” for Mac. b. Adjust the shutter speed and exposure a bit. Fantastic! Everything is set up and you’re ready to film! Climb in your directors chair, unroll your storyboard and make your animation shine. Film everything. Even wiping out drawings can look cool in your animation. Stay focussed. Even though you might not be drawing, you’re the one with the overview. Help your talent with the sequence of the animation, the composition of the drawings and make sure that notting is forgotten. Make jokes. Some scenes need many retakes. And it’s going to be hot under all those lamps. Everybody’s energy levels may drop. Humor keeps everyone fresh and fruity. This is the last part of the lighting proces. Use the settings of a movie editing program like Final Cut Pro or Adobe After Effects to dot the i’s and cross the t’s. Determine also your white color. The same way as black, but now check the whiteboard itself. We just pushed the white exposure and pulled the blacks a bit as you can see in the image below. You can check when it is enough by checking your image with the Digital Color Meter. Now you know how to get a professional looking whiteboard animation! 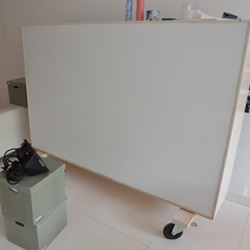 To show you what the result looks like, we’ll show you a snapshot of a whiteboard animation we made for a client. Ah! A bonus. 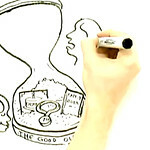 The audio in whiteboard video’s are usually narrated. So you need a studio to record your story. Of course, being on a shoestring budget we found another way. Tip! Tape your script to the sofa. This way you won’t hear any noise coming from the paper. In the next part of this two-piece blogpost we’ll tell you how we made the script of our whiteboard animation! Excellent tutorial. Thanks. I am also interested, been looking a while for some tips on how to setup. Can you share some tips, small example on how to animate something on the whiteboard? Great info – I would love to put aside some time and have a go at doing one of my own! The best tutorial on whiteboard lightning I could find. Thanks a lot! Your video looks much better than the one in the YouTube link you recommended. The dark color on that video is too white. In your video it’s just perfect! If I wanted to light a paper and do it so while the paper is on the table, would the setup be any different? I should basically just turn your whole setup by 90°. It’s also very interesting that no light source is hitting the whiteboard directly. Everybody else lights it by pointing a light source directly at it. Hi Andrew, the basic setup should work for a paper on a table too. Although you might have to tweak the position of the lights. A direct lightsource casts a lot of shadow which you want to compensate with a different lightsource, etc. So what you really want is a indirect lightsource that shines from _all_ directions… which is practically impossible but this setup gets you quite far. Candide, you really know how a professional deal with the process of whiteboard animation. 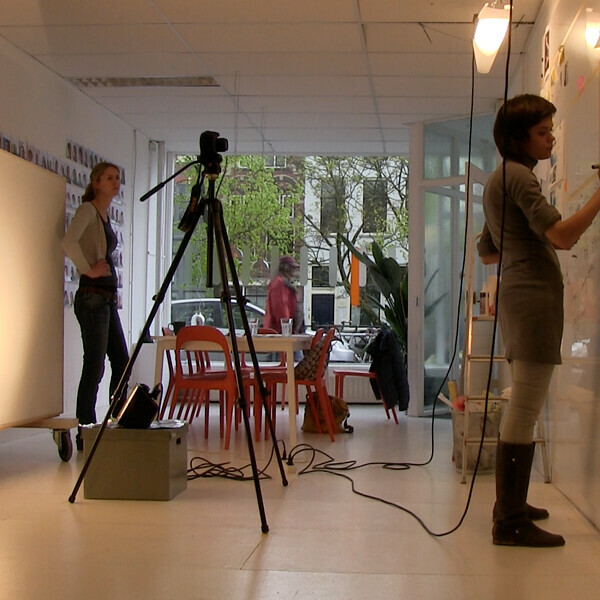 Whiteboard Video is great for promoting complex ideas. Will wait for your next post on whiteboard video script! Hello. Many thanks for post this. its so nicely put together. I had a question about pan and scanning during the animation. Something I’ve seen on many videos like this. 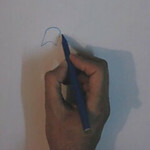 Is this actually done by moving the camera and reframing every time we want to draw onto the sides of the main drawing? Or is it done with a locked off camera and somehow stitched together afterwards in post? Any tips would be much appreciated very much. Part 2 of this blogpost is published! Create meaning, craft a storyboard and design the whiteboard animation. Check it out! Hi there every one, here every one is sharing these kinds of knowledge, thus it’s nice to read this weblog, and I used to go to see this webpage all the time. Thank you. Interesting information on lightening . WOW!, what a guide, its great that you share the details of the equpment used. Thanks for your detailed tutorial. Indeed This animation style has become quite popular in the last few years and it seems that viewers react quite well to these types videos. Wow amazing tutorial presented by you in this post and it is very informative about how to make an animated explainer video. I love to read more about it in your next posts.